Galini Pension v Ios, Řecko: Zarezervujte nyní! 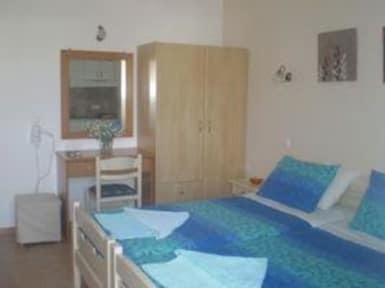 The hotel needs to be notified of any cancellation or reduction of numbers 21 days before arrival,14 days before arrival you will be charged 2 nights,7 days before arrival you will be charged 50% of the balance due ,and In the case of no show you will be charged 100% of balance due. Galini Pension is a family run business,all standard rooms are well equipped with modern facilities, WiFi,air-con, tv ,fridge,hairdryer and en-suite.We also have some studios with kitchens inside, all surrounded by a beautiful tropical garden,footsteps away from the beach, most of our rooms have balcony's or verandas, some of the balcony's and verandas have sea view. You can relax and enjoy our beautiful tropical garden, both picturesque and quaint with that lovely Greek island feeling from within .Galini which is nicely situated beside yialos beach and the port of ios,also offers everything you need, from the area within ,beaches, water sports,,nearby shops, restaurants, supermarket, plus great coffee bars,etc. We are also not far from the village, nothing is far in Ios! All our guests are given a safe box and map on arrival. We are there to help our guests at any time, so they can enjoy our beautiful island to its best. 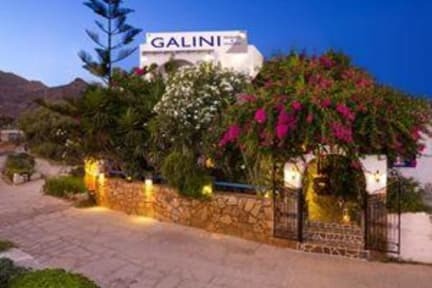 Galini is very peaceful so you can relax and have whatever you want from Ios ,weather its to enjoy the peaceful and friendly atmosphere from within or go out and see the bright lights and energetic life of Ios.